The past couple of weeks have been full of more ups and downs than is usual for me. Nothing major, just stuff that could be done without. And really, as of today (I started this post yesterday), I feel the stress ebbing away to a manageable trickle. I am naturally a person who likes things on an even keel. I absolutely do not thrive on stress – I would be quite the worst business person. Certainly you will never see me cowering before The Dragons’ Den dragons, touting an idea. Or even pitching up in a pinny for The Great British Bake-Off, like my brave and talented friend Urvashi. That’s just not me. With the exception of GBBO I don’t even like to watch shows with conflict, confrontation or stress. Well, an exception for House of Cards, too. How can anyone resist Kevin Spacey’s sly, to-camera asides, delivered in that snake-oil Southern drawl? When I feel too stressed I am one of those people who ‘forgets’ to eat: by the looks of me you will see I haven’t been too stressed lately! But in the distant past I have undergone stressful times where eating ended up being an unenjoyable chore. Something to be got through. It seems almost unthinkable that I, a food writer, recipe developer and health educator, would not enjoy food. That food would be as hard to swallow as cardboard, and taste similarly. But that it has. I see a good deal of people on my cancer nutrition courses and individually who find eating difficult, not only because of stress – from their diagnosis, family reactions to diagnosis, fear of the treatment, etc – but also because of the changes in digestion, appetite and taste that can occur with chemotherapy treatment. This reality tends to put my own issues in perspective. And with stress often comes tiredness. That’s where this simple little recipe comes in. (You were probably wondering where I was going with this little pity party.) Not only is this matcha yogurt breakfast bowl extremely nourishing, with contrasting textures – which you can customise if, like some of the people I see, you have a sore mouth or swallowing issues – it is quick, light and pleasing to the eye. Cheerful even. Who can resist a lurid green yogurt? Like something from a child’s recipe book. Or worst nightmare, perhaps? I posted a pic of my matcha yogurt breakfast bowl a few weeks ago on Instagram and it seems people were intrigued rather than repelled. Which is always reassuring! The nutritional properties and benefits of yogurt are legion. We all know that good yogurt – the live stuff – is, of all the dairy products, massively beneficial for gut health (almost always an issue as we get older and our gut, ahem, slows). But it is also be good for the immune system too. And thick, Greek yogurt has the added bonus of being especially high in protein. This means a smaller amount is satisfying. Probiotic vegan yogurt is a great alternative. For an omnivore I don’t eat many dairy products – the occasional cheese binge, a once in a blue moon ice cream. I tend to rely on non-dairy food sources like fortified almond milk, dark leafy greens, tofu, beans and nuts for most of my calcium. But we all like good yogurt in our house, and recently it came to me that matcha tea (powdered green tea leaves), honey and yogurt might be a nice idea. And it certainly was/is. I also had some seasonal-for-now blood oranges on the windowsill and walnuts in a nearby jar. In they went and down it all slipped. Quite easily. And nothing tasted of cardboard. Just a heavenly, herbal-sweet creaminess punctuated by the raspberry tang of the dripping-ripe blood orange. The walnuts added the texture hit I wanted, but one could easily do without – or blend the whole thing into a smoothie – if swallowing is tricky. I could hardly remain blue or stressed in the face of such colours and tastes, now could I? It is sometimes the little things that tip us over, but also little things that pick us up. And interestingly, despite the matcha containing caffeine – which I cannot normally ‘do’ – it also contains a significant amount of l-theanine, an amino acid that reduces mental and physical stress, aids cognitive function (clearer thinking), boosts mood and increases alertness. Quite an interesting blend of benefits, I’m sure you will agree. Like the equally intriguing spice turmeric, I add matcha to loads of likely and unlikely foods and drinks. You will see both in quite a number of recipes on food to glow. Here’s a link to some interesting facts from cancer.gov about tea and cancer prevention. Matcha is easily available online, but any good health food store will carry it. The good stuff – organic and not ‘cut’ with anything or flavoured in any way – will cost a pretty penny. I am not one for spending lots on luxury things. I wear the same old clothes and shoes day in and day out. I shop at Lidl. But I make an exception for matcha. Some brands are just not that great and can be bitter. I use VitaLife (the ceremonial grade, not cooking grade) because they do a handy 3 for 2 offer, and the unopened tins last forever. It tastes terrific – clean, bright, gently herbal. But I have also used, and like, Teapigs (my favourite), Steenbergs and Clearspring. I buy the large pots as Miss R and I drink it cold daily and I add it into smoothies, like my Pretty Green Tea Smoothie, Green Smoothie for the Green-phobe, this Tummy Tonic Juice/Smoothie (it can be either very easily). Even this cake. And these blondies. If you have never tried matcha before but would like to do so, perhaps purchase a small tin and follow the directions, which basically involves mere whisking. Mostly people drink it hot (not boiling hot as this impairs the principal phytochemical, epigallocatechin-3-gallate), but I prefer it cold. When I drink it I nearly always add some fresh lemon or lime as this not only tastes fab it also helps us better absorb all of the healthful catechin compounds, of which there are numerous. Matcha isn’t soluble so it won’t behave like the powdered flavoured black teas you get at the supermarket – you are drinking finely ground leaves with all its fibre, after all. Once whisked I tend to give it a stir with a spoon once or twice while drinking it. I used to give the glass a quick swirl to redistribute the silty green powder, but that almost always led to me wearing more green tea than drinking it. Here is a link to the proper, Japanese way to whisk matcha, and the traditional implements with which to do so. And here is a great little blog post on kitchen butterfly, with words and pictures about whisks around the world, including the Japanese chasen. The Nigerian author is a real whisk and kitchen tool enthusiast who writes lovingly and authoritatively about these humble tools. Be warned: you may want to start your own collection! Do you like matcha? Do you find it helps with stress, alertness or mood? Or, do you just drink it because you love it? Add the yogurt to a mixing jug or bowl and sprinkle over the matcha and drizzle in a little honey or maple syrup; whisk in thoroughly. Pour into a serving bowl and top with sliced blood oranges and crumbled walnuts. Eat immediately. Other possibilities: berries and chia seeds; grated apple and muesli (for a green Bircher-style muesli); cherries and almonds. For a solo dessert you might like to top the yogurt and fruit with a crumbled amaretti biscuit, ginger oatcake (eg Nairns) or a gingersnap. Or layer it up with these ingredients for a quick dessert to share with others. * If you are currently undergoing chemotherapy you may have been advised not to have live yogurt. If this is the case, substitute with non-live yogurt (often the supermarket’s own brand ‘set yogurt’ is not live) or use from fromage frais or Quark, which tastes similar to yogurt but is not cultured in the same manner. Soft food diet/swallowing difficulties: blend all (including walnuts) in a powerful blender, perhaps adding a little ice to thicken and cool. Pour in a tall glass and drink immediately. I love matcha tea powder, but this is a new way to enjoy it! I need to find some soy yogurt! I also don’t like watching conflict – at all, but I also discovered that I don’t like watching shows with romances that finally happen and then start to have problems! I’d say it’s the romantic in me, but really I think I just like my happily ever afters to be neat! I like my happily every afters too. But I have already gone against my post by gorging on all but the last episode (not on on-demand just yet) of he hit UK cop drama, Line Of Duty. Nail biting stuff! I hope you find time to make up this simple breakfast/snack. Great suggestion 🙂 I’ve never thought of trying this before so I’ll have to put it on to to-do list! I can totally relate to not eating when I’m stressed, but for me I ended up putting on a lot of extra weight (damn you cortisol!) that was really, really stuborn to shift. damn that cortisol!! It happens to me too now that I have hit middle age good and proper. A little stress-fast used to see the pounds drop away in the olden days but now I get a paunch for my troubles. Boo! I’m a huge fan of matcha, but have only tried the clear spring brand. Mostly taken in smoothies or teas. Recently in California I obtained a slight obsession with almond milk matcha lattes and am now on a mission to find the best ones in London! So creamy and a subtle uplifting caffeine hit without the jitters and with the antioxidants! Yoghurt sounds like a fab idea! I think the best one in London will be in your kitchen, Ceri x PS I LOVE almond milk matcha lattes. It is mine and Miss R’s drink of choice when we are hungry, thirsty and/or need to keep alert! I bought some matcha powder ages ago to make a matcha tea loaf that I’d seen a recipe for but it is still in my cupboard! I am a massive fool for yogurt – I love it – and I am intrigued by the bright green yogurt and shall definitely be making this. Blood oranges are not something we come across that often in the UK so I may need to try pink grapefruit or something but I’m drooling at the thought of this which means it must be a good idea! Thanks! This sounds like it might be a matcha (geddit it?!) made in heaven for you then! 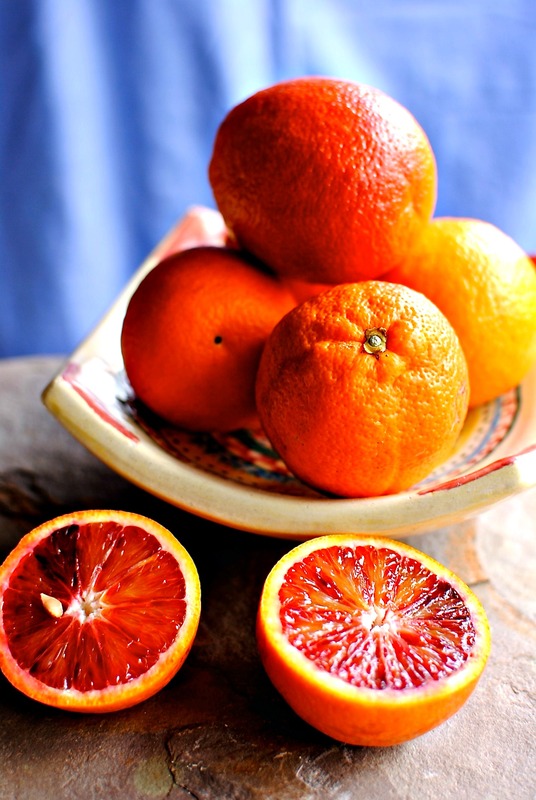 Oh, I live in the UK too and can still find blood oranges in Asian shops and Waitrose. Or how about recreate the berry-citrus taste with orange and raspberries? That reminds me now that my spiffy new oven is in I need to get back to making granola. Granola would be fab with the matcha yogurt but maca is a great idea – Katie at The Muffin Myth uses it a lot too. Must get some. Love bee pollen in smoothies! This is stunning. I actually don’t have any matcha tea powder. Maybe I’ll look in the Asian market. I love the benefits green tea seems to tout. I’m not sure if you will find it in the Asian markets but you might. I get mine online but good health food stores will hopefully stock a few varieties. One type I don’t like is the kind with ground roasted brown rice. I know a lot of people like it but I absolutely can’t abide it at all. Genmaicha is what it is called and is not the same as matcha. Thanks Elaine. Much better. I took out my frustrations and stress on some Ikea flatpack furniture. Much more productive than anything else as I now have a guestroom/food props room full of cool furniture! I love knowing what I eat and where it comes from! Especially how traditional Matcha came from Japanese culture! Your photos are just gorgeous! Thanks Miss Jo. I appreciate your writing in and letting me know. With those vibrant natural colours I really would have to screw up to get those pix wrong! But other people do – and you don’t! We’ve been having this in various forms ever since you instagrammed it, brilliant! 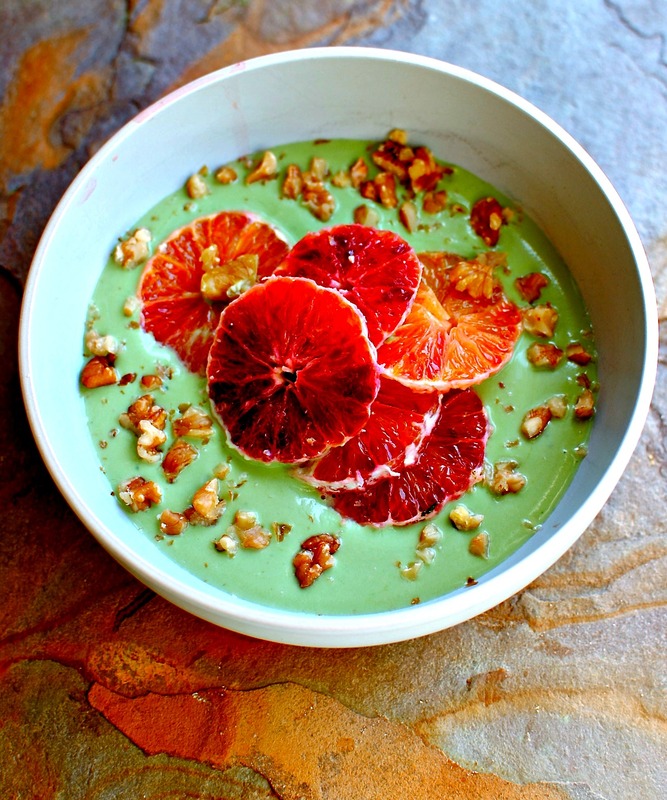 I think I am glowing just looking at this gorgeous green bowl of goodness! I used to have some matcha tea, but am all out, so definitely need to re-stock to give this a try. Have a wonderful weekend my dear!!! I’m with you Kellie – no way would I put myself through Dragon’s Den or Masterchef. My family are addicted to shows with competition but my Mum is like you and dislikes anything like that – I think she feels too sorry for the losers. Hope things get back on an even keel soon. Beautiful recipe as always. Thanks so much Sally. And I so appreciate the tweeting on my behalf. As I’ve said before, I’m rubbish at social media! HI! I’m Simi an italian food blogger! i follow your! is very nice! Thanks so much Simi! I will have to visit your site. The colours together look amazing and sounds gorgeous! Beautiful post, Kellie! I know what you mean about those little things adding up and wearing you down. Glad that they seem to be smoothing out now. I love matcha, but for some reason haven’t taken the plunge to making it at home. This post – and that 3 for 2 deal – are going to push me over the edge! Do you suggest buying the proper whisk and all that jazz? I eat good quality yoghurt each day, and I’ve taken to swirling maca into it, but matcha could be a good alternative as well. I still haven’t tried maca yet so I will try it if you try matcha. Okay? And we will report in and compare notes. As for the whisk, I use a wooden handled sweet little milk frother and it works brilliantly for glasses as opposed to wide mugs for whisk action. I just press the handle back and forth like you would for starting a fire with rocks or something (!) and it foams right up and aerates. I have a photo of it on Instagram (which should be in the sidebar for easy reference). Hope the write up is going well, btw. Well aren’t your girls so thoughtful? What a lovely pressie. It will be absolutely wonderful with your yogurt recipe, and no need at all to sweeten. Enjoy the hell out of the season change. I hope all your plants survived the extra heat. And you for that matter! That is so pretty Kellie! I love Matcha and usually use it for lattes with almond or hemp milk. I should start getting more creative with it! Dear Kellie, your very honest post is one that I can relate too. Each time master chef starts a new season I get a load of texts, ‘you should go on there’…no. I think I inherited the stress gene from my dad and I certainly don’t like it. I hope your stress levels have subsided and that you are feeling that even keel more so now. The almond milk matcha lattes sounds divine….. Thanks for the mention and I mjust confess GBB was probably one of the most stressful things I have ever one. fun but stressful. Like you I forget to eat. especially if I have a day of going from meeting to meeting and call to call I don’t get time to pop out for something. It’s not good because you end up tired and grumpy and like yesterday falling asleep at 8pm and going right through to 6 this morning! 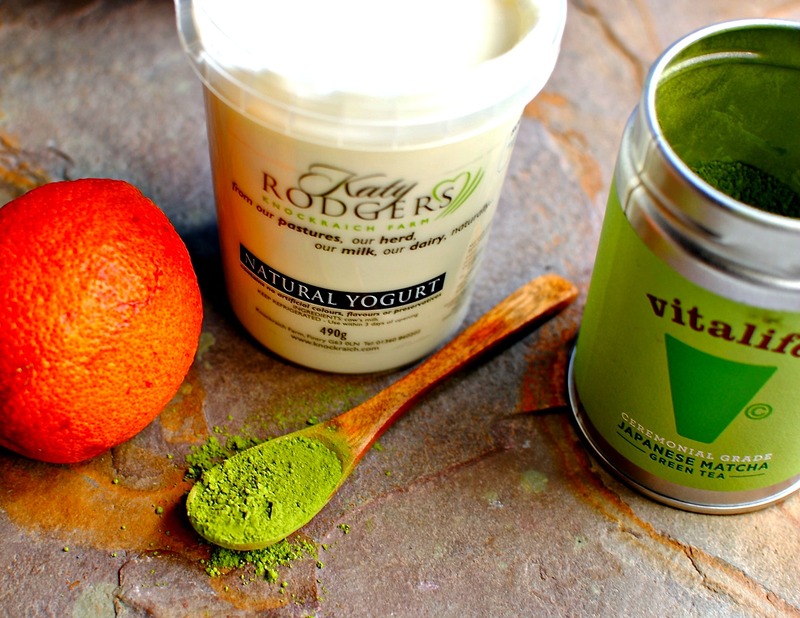 I love the idea of matcha in yoghurt and am asking why I never thought of this before!! So simple,. So vibrant and as you say so nutritious if using the right live yoghurt. Wow! Such bright and vibrant colours!